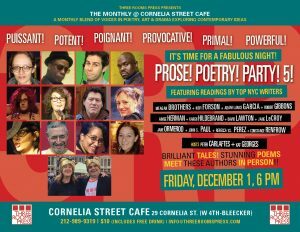 For our monthly event at The Cornelia Street Cafe this December we are hosting our annual holiday party. Prose! Poetry! Party! 5! The event is hosted by Three Rooms Press co-directors Peter Carlaftes and Kat Georges. All audience members will be eligible to win fabulous free prizes throughout the evening!